Factory Five broke the mold for traditional “kit car” Hot Rod in 2008 when it introduced its "Factory Five '33" Roadster. A sensation at the that years SEMA Show, it went on to earn "Best in Show ~ Hot Rod" and "Best Engineered Product ~ Runner Up".According to Factory Five, the “FF33” became internationally recognized as one of the finest kits in the industry. The Factory Five 1933 Hot Rod is a comprehensively engineered and fully integrated Street Rod. The car is not a hodgepodge of parts, but a professionally designed Pro Street car that is as comfortable cruising the streets as it is on the show circuit. 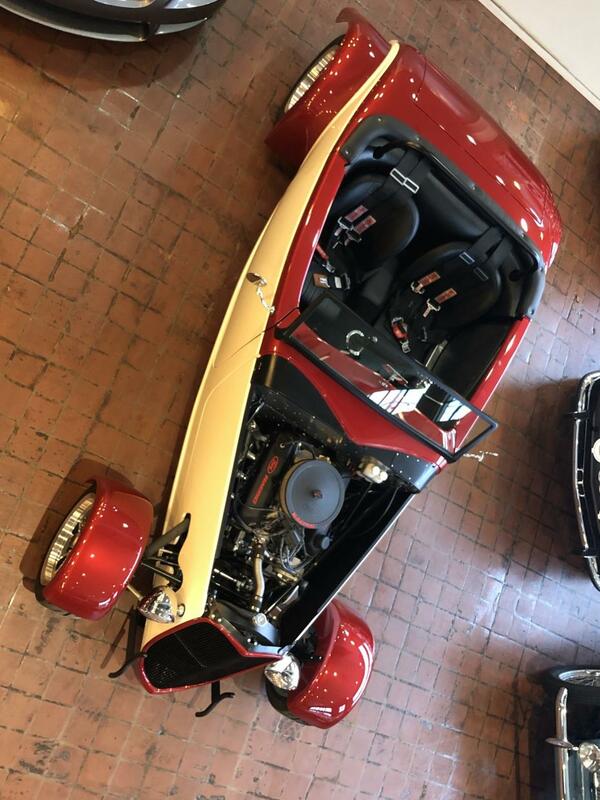 Factory Five's fully engineered tube chassis combined with some of the best suspension and braking componentry has earned recognition industry wide and has changed the way people think about the stereo-typical Hot Rod. The car on offer is Ford Factory Five 1933 Hot Rod (Complete Kit). The car was built Professionally built by ALTEZZA Restorations in Bridgeport, CT. Altezza is a high end restoration shop, with years of experience with high end collector restorations. The build was done with an open wallet, and attention to detail show in every inch of this build. Build specifications; -BluePrint Engines 5-liter Ford crate engine -5 speed manual transmission -BBK headers -Wilwood master cylinder and pedals -Holley carburetor -TOYO Proxis R888 tires -Mustangs Unlimited 17” wheels -Mustang Cobra rear end 3:55 gears -4-wheel disc brakes -Black leather seats -Fenders The car puts it power through a high performance clutch and an 8.8 inch Ford Mustang differential with limited slip and 3.55 gear ratio. The 3 Link rear suspension working with the Cantilever front suspension with coil overs keep this hot rod anchored to the pavement and the 4 Wheel disc brakes actuated by the Wilwood Dual Master cylinders ensure excellent stopping capability. The car has an Electric Cooling Fan as well as hand fabricated brake lines and fuel lines, With only break in miles, the car is well sorted and the performance and drivability of this car is amazing. It is very fast and powerful, but it is also extremely well behaved in all driving situations. The Factory Five “Hot Rod” has redefined hot rodding. Its tube chassis and componentry gives a most excellent modern base to build a car to tastes. What separates this car from the rest is the massive attention to detail not only in performance and drivability, but also in the aesthetic execution of the build. The paint is show quality and all parts of the car are professionally built. If a 33 Hot Rod is in your wheel house, then this car is a must consider over any other purchase or project build. It does not get much better. The car comes complete with the Assembly Manual; a massive folder of receipts, notes and services; overview outline of the build and well painted and mounted wind wings.